Don’t you ever think how things were much simpler in the olden days? More so in the Stone Age era. An era when you didn’t have to anything to make yourself look beautiful? No pollution. Healthy food. No stress. And voila! Naturally beautiful skin and a head full of hair gliding down your back. For reference, see Pocahontas. But that was so yesterday. Today, women want to run wild with the wind, achieve all their dreams, and all that could cost a little of you. Although, you do not have to worry anymore. In our journey to be the best ladies beauty salon in hyderabad, you come first. We are working hard to make sure our unique services help you feel good from within. They definitely sound exotic right? Well, they are. Is that it? Of course not. Along with providing you with these amazing services, we will also surprise you with offers that even the current best ladies beauty salon in Hyderabad can’t. You can book your appointments online and get special discounts on any service you please. Generous much? Yes it is! This was just a tiny bit of information about our endeavour to become the best ladies beauty salon in Hyderabad. We’ve got a number of other regular services too. If you like it simple, just ask. Nevertheless, be prepared to be treated royally. Still unsure about our efforts? Certified expert professionals: Ask them to do whatever, seriously anything! (just maybe not a Moonwalk) The result would be better than you had imagined in your head. Premium products: Every product used is branded. The discount rates are just because we care. If needed, feel free to check the products before they are used. Our Salon Manager would be more than happy to help. Privacy: We understand how uncomfortable a clustered parlour could be (Hell, we’ve all been there). Private rooms are allotted to help you relax and relieve. Hygiene: Now this is the most important of all things a parlour needs to focus on. Just Flaunt Salon is structured keeping in mind what a women really wants and therefore, a UV sterilizing unit for scissors and combs has been set up to ensure you are treated like the first customer, EVER! Ladies only, Please! Women want, need, demand more privacy. And they sure deserve it. 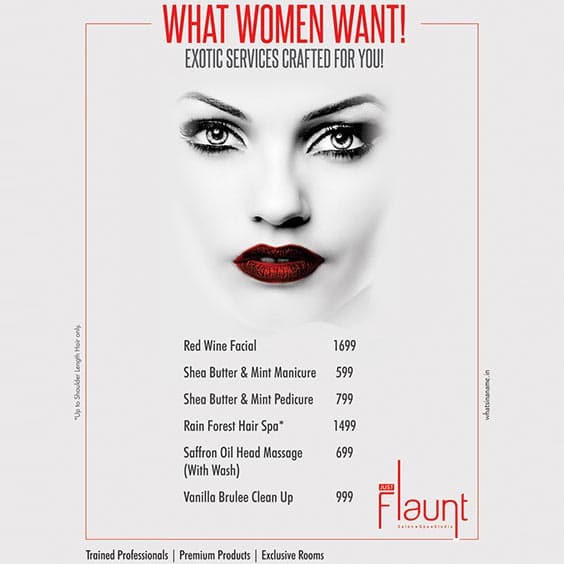 Just Flaunt Salon thus, is built to treat women with all things good, and all things right. Well, we can say whatever we want, but if you still do not believe this small sanctuary to be all things mentioned above, you should definitely book an appointment soon and see it for yourself.